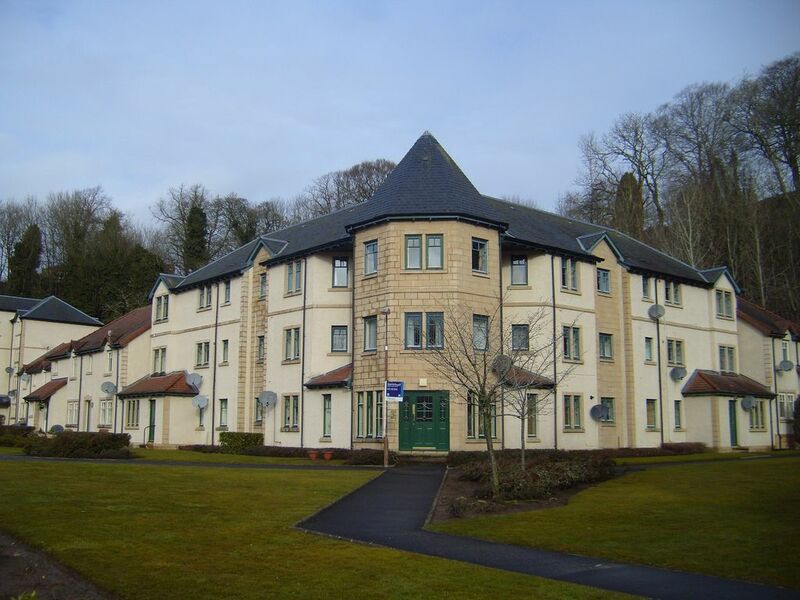 This is a top floor flat in a very attractive estate in the town of Penicuik, close to Edinburgh. There are regular buses into the city every 10 minutes and the journey usually takes about 30 minutes. There are also night buses 7 days a week. The Scottish borders are also easily accessible and there is a regular bus service to this area too. Bedroom 1 has a double bed and an en suite shower room. Bathroom 2 has bath, wash basin and toilet. Sitting Room is a large room with bay window. It has comfortable seating for 8 ,TV, DVD and CD and Internet connection.There is also a wide selection of books ,board games and toys. Kitchen has a breakfast bar and is very well equipped with oven,hob,fridge,freezer,washing machine /dryer and microwave. All towels and linen provided and the property is cleaned at the start of your stay. Parking in a designated bay at back and ample parking at front. There is also a children's play park on the estate. 2 flights of stairs. There is no lift. Golf .There are several golf courses locally which are open to visitors. Skiing. Hillend dry ski slope,which is the largest in Europe, is a 10 minute journey away. Rosslyn Chapel is also close by. Walking and Cycling. The close proximity of the Pentland Hills offers excellent hill walking. There are also several off road cycle paths and walkways which are directly accessible from the apartment. There are a wide range of pubs,restaurants,cafes,local shops and supermarkets within walking distance of the apartment. There is also a new Leisure Centre with swimming pool, and a large public park with play park and skate park. A “Soft Play Centre” is situated 5 minutes walk from the apartment. I bought this property new in 1996 and it has been my home for the past 18 years. My circumstances have changed and I now live in Edinburgh.. I hope that visitors to my apartment will enjoy staying there as much as I did. Main Bathroom has a bath, wash hand basin and wc. The En suite has a mains water power shower, wc and sink. Sitting Room is a large room with bay window. It has comfortable seating for 8 ,TV, DVD and CD .There is also a wide selection of books ,board games and toys. Wide selection of books in "English"
Hillend dry ski slope,which is the largest in Europe, is a 10 minute journey away. Lots of golf courses within 5 miles of the property. Within 30 minutes there are a large number of courses available either in the Scottish Borders or in Edinburgh. Lots of which are open to visitors. The most comfortable and well equipped holiday accommodation with easy access to activities in Edinburgh and the surrounding countryside. We enjoyed our Easter mini break and hope to return again during the Summer. Happy to recommend this property to anyone. Many thanks to Jean for her thoughtfulness and attention to detail. Thank you Dot,once again you were perfect guests. I look forward to you returning in the future. Fabulous flat with all amenities. Place was clean and nice decor. Excellent long tub , much needed after long days walking. Quaint town and quite location. Would consider staying again in the future. Very comfortable flat. We had everything we needed. Would definitely use this accommodation again. Jean M was extremely helpful. Thank you, you were perfect guests. Jean came and saw us at the flat and told us everything we needed to know. The flat is lovely Jean has thought of everything you will need for a lovely stay here. It’s just outside Edinburgh we used the bus one day to get in which is great value for money and is easy to do. Would definitely come back here again. So much thought has been put into making this holiday accommodation a home from home. A clean, comfortable, light and airy flat meant we had a relaxing week but also, due to its location, were able to travel into Edinburgh and down the coast to other tourist attractions. Would definately reccommend this flat and book it again ourselves, for future holidays. Thank you so much for your lovely comments, I am glad you enjoyed staying in my apartment. We really enjoyed our stay. It was very pleasent. We really had a great break . The property was clean,tidy - nice bathroom plus a nice en suite and also very pleasently decorated. Would defnitly want to go again!!! Thank you for your lovely review,I am so glad that you enjoyed your stay. Edinburgh is 30 mins away by bus. Booking Notes: Deposits of £50 are required with the balance to be paid 8 weeks before commencement of holiday. A booking form is available on the website,which should be posted or emailed at the time of booking. Changeover Day: Flexible Notes on prices: Nightly rates (min 3 nights) available on request.